Properties FormDrops Ideal ForFemale Weight69 (gms) Dimensions3 (cm) x 3 (cm) x 9 (cm) Dosage of Dr. Reckeweg R20 Generally 3 times daily 10-15 drops in some water. Terms and Conditions We have assumed that you have consulted a physician before purchasing this medicine and are not self medicating. Properties FormDrops Weight50 (gms) Dimensions3.5 (cm) x 3.5 (cm) x 8.6 (cm) Dose 10 Drops with 1/4th cup water 3-6 times daily for 5-9 months. Terms and Conditions We have assumed that you have consulted a physician before purchasing this medicine and are not self medicating. Properties FormDrops Weight50 (gms) Dimensions3.5 (cm) x 3.5 (cm) x 8.6 (cm) Dose: 10 to 15 Drops with 1/4th cup water 5 times daily for 6 months. Terms and Conditions We have assumed that you have consulted a physician before purchasing this medicine and are not self medicating. 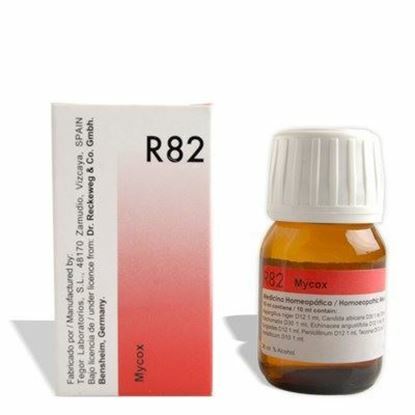 Properties FormDrops Weight75 (gms) Dimensions4 (cm) x 4 (cm) x 7.3 (cm) Dosage of Dr. Reckeweg R82 For external indications apply R82 topically to affliction several drops twice daily to condition. R82 is safe for external application even into children's ear with cottonswab (if no perforations of tympanic membrane). Internal application: 10 drops 3 times daily. If the dosage provokes extreme bowel cleansing or too loose stools have the patient back off of the dosage to 1 drop 3 times daily and build up the dosage gradually As a preventive use 5 drops every other day to prevent recurrence. In sensitiveness to alcohol use 10 drops in a glass of warm water. Let alcohol disperse for one minute. For children under 2 years old administer the drops externally into the belly button and let the child rub the remedy into the skin. Terms and Conditions We have assumed that you have consulted a physician before purchasing this medicine and are not self medicating. 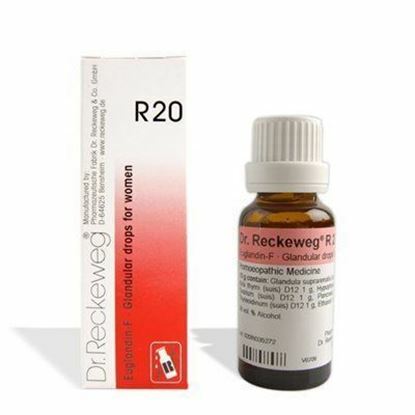 Also known as R 1, R01, R 01 Properties FormDrops Weight69 (gms) Dimensions3 (cm) x 3 (cm) x 9 (cm) Indications of Dr. Reckeweg R1 Local inflammations, acute and chronic, of catarrhal and purulent nature, with swelling of the glands. Sudden infections and high fever, with irritations of the meninges, conjunctivas and pharynx. In particular: Inflammations and suppurations of the Iymphatics of the pharynx, mainly all forms of tonsillary angina, tonsillitis, scarlet fever, otitis media, conjunctivitis, iridocyclitis, meningitis, inflammations of the maxillary sinus and of the dental roots. Inflammations of glands; mumps, orchitis, pancreatitis, cholecystitis, appendicitis, parametritis, bartholinitis. Monarthritis, arthritis urica. Lymphadenitis, Iymphangitis, phlegmonous inflammations, abscess, withlow, furuncles and carbuncles, erysipelas, quinsy. 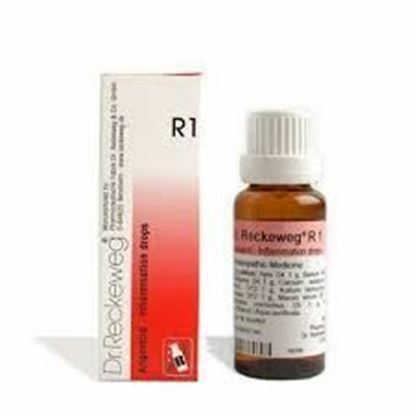 Mode of Action of Main Ingredients in Dr. Reckeweg R1 Apis mellifica: Inflammatory infiltrations, edematous swellings. Barium chloratum: Chronic diseases with swelling and suppuration of the glands in different scrofulous affections of children. Belladonna: Inflammatory hyperemia of skin, of mucous membranes and glands. High fever. Aridity of the mucosa, delirium, moist feverish skin. Calcium jodatum: Chronic tonsillitis of children, scrofulous increase of Iymph nodes on neck and nape. Hepar sulfuris: Tendency for catharzic inflammations and pyesis. Kalium bichromicum: Plastic exudation of mucous membranes in nose, pharyngeal cavity and pharynx. Viscous, stringy mucus. Mucosae ulcer. Marum verum: Adenoid vegetation, chronic catarrh of the postnasal space. Mercurius sublimatus corrosivus: Acute inflammations of the mucosa involving the glands, sticky perspirations. Phytolacca: Swelling and dark reddening of the pharynx and tonsils, radiating pain up to the ears Dosage of Dr. Reckeweg R1 In case of acute infections with high fever, in the beginning 10-15 drops in some water every ½ hour for ½ - 1 day. Same treatment to be followed in case of purulent inflammations (e.g. : inflammations of the tonsils or furuncles). After improvement, take same dose every 1-2 hour. After recovery it is advisable to take 10-15 drops 2-3 times a day for about a week. 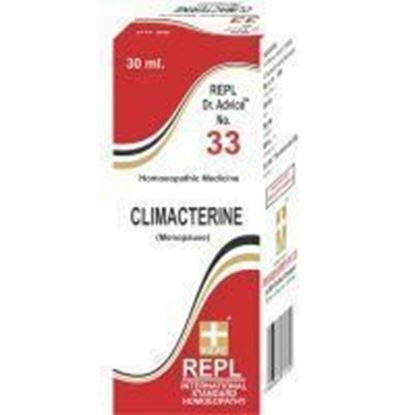 Chronic inflammations: 2-3 times a day 10-15 drops. Constitutional modifications in chronic glandular hypertrophy of children; once a day 5-8 drops in some water for a longer period of time. Terms and Conditions We have assumed that you have consulted a physician before purchasing this medicine and are not self medicating. Properties FormDrops Weight50 (gms) Dimensions3.5 (cm) x 3.5 (cm) x 8.6 (cm) Dose: 5 to 10 Drops with 1/4th cup water 3-4 times daily. Terms and Conditions We have assumed that you have consulted a physician before purchasing this medicine and are not self medicating.